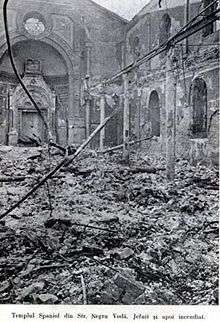 The Legionnaires' rebellion and the Bucharest pogrom occurred in Bucharest, Romania, between 21–23 January 1941. As the privileges of the paramilitary organization Iron Guard were being cut off gradually by the Conducător Ion Antonescu, members of the Iron Guard, also known as the Legionnaires, revolted. During the rebellion and pogrom the Iron Guard killed 125 Jews, and 30 soldiers died in the confrontation with the rebels. Following it, the Iron Guard movement was banned and 9,000 of its members were imprisoned. The Molotov-Ribbentrop Pact (August 1939) gave the Soviet Union a green light to take back Bessarabia and northern Bukovina in June 1940 (see June 1940 Soviet Ultimatum, and Soviet occupation of Bessarabia and Northern Bukovina). Then in August 1940, Germany and Italy mediated Romania's disputes with Hungary about Transylvania (resulting in the Second Vienna Award), and with Bulgaria about Dobruja (resulting in the Treaty of Craiova). Large areas of Romania were ceded to Hungary and Bulgaria. ... the Legionnaires wanted everything, and they wanted it immediately; Antonescu, while sharing the same goal, intended to achieve it gradually, using different methods. The leader stated this clearly in an address to Legion-appointed ministers: "Do you really think that we can replace all Yids immediately? Government challenges are addressed one by one, like in a game of chess." Antonescu, who had the support of Romania's military, met with Adolf Hitler on 14 January 1941, in Germany. During this meeting he promised Hitler the cooperation of Romania in any future German conflict with the Soviet Union, and gained Hitler's silent agreement to eliminate Antonescu's opponents in the Legionnaire Movement. Between 17-19 January the Legionnaire movement conducted a series of "lectures" throughout Romania, designed to demonstrate the National Socialist nature of their movement and to show their loyalty to Hitler. Antonescu took measures to curb the actions of the Legionnaires, and on 19 January issued an order canceling the position of Romanization Commissars: well-paying jobs, held by Legionnaires. Additionally, he fired the persons responsible for terror acts committed by Legionnaires, from Minister of the Interior Constantin Petrovicescu to the commanders of the Security Police and the Bucharest Police. He appointed loyal military men in their place. The military also took control of strategic installations, such as telephone exchanges, police stations and hospitals. The district officers of the Legionnaires were called to the capital for an important economic consultation, but found themselvs arrested in the middle of the meeting. On 20 January 1941 a German officer was killed in Bucharest by a Greek citizen. This affair remains unsolved to this day, but it was the spark that lit the Legionnaire Rebellion. Antonescu had replaced the commanders of the Security Police and the Bucharest Police, but their subordinates, who received their orders from Horia Sima, refused to allow the new commanders to take their place. Armed Legionnaires captured the Ministry of the Interior, police stations and other government and municipal buildings, and opened fire on soldiers trying to regain these buildings. Antonescu's public addresses, intended to calm the public, were not published or broadcast, as the media was under Legionnaire control. The Legionnaires called the people to rise up against the Freemasons and the Jews (hinting at Antonescu's relations). The people who were possible targets for assassination by the Legionnaires were held, for their own protection, at the Ministry of the Interior. The Legionnaires' leaders, headed by Horia Sima, went underground. The Legionnaires held mass drafts at neighboring villages, and masses of peasants flooded the streets of Bucharest, answering the call to defend the country against the Jews and Freemasons. The Legionnaires took over gas stations and tankers, and used burning oil cans as a weapon against the soldiers. Only 15 loyal officers remained with Antonescu in his palace. For two days the Romanian military defended itself and tried to besiege the Legionnaires' strongholds, but did not initiate attacks and gave them a free hand. During this time the Legionnaires published announcements claiming that the Jews had "revolted". During the days of the rebellion, the Legionnaires' newspapers (the only ones active during this time) engaged in vicious propaganda against the Jews. At the end of the articles would appear the motto "You know whom to shoot". The Bucharest pogrom was not a side effect of the rebellion, but a parallel event, purposefully organized to give legitimacy to the rebellion and to equate the Legionnaires' opponents with Jewish sympathizers. Many parties took part in the riots against the Jews: police officers loyal to the Legionnaires, various Legionnaire organizations, the workers' union, student union, high-school students, Gypsies and criminals. The attacks on the two Jewish boroughs (Dudeşti and Văcăreşti) began a few hours before the rebellion. Minister Vasile Iasinschi gave the order to set the Jewish neighborhoods on fire, and mobs stormed Jewish homes, synagogues and other institutions. The Legionnaires' headquarters became torture centers, and Jews kidnapped from their homes were brought to them. Jews' homes were set on fire and the Jews themselves were concentrated in places where they could be tortured to take their property and their women raped. Jews were murdered at random, but also in planned executions. Some Jews were thrown from the top floors of the police headquarters building, and others killed in the slaughterhouse. Soldiers did not take part in the pogrom, nor did police officers loyal to Antonescu. Those officers were forced to surrender their weapons and uniforms, and put under arrest. "he recognized three of his acquaintances among the "professionally tortured" bodies (lawyer Millo Beiler and the Rauch brothers). He added, “The bodies of the dead were hanged on the hooks used by slaughterers.”" The American minister to Romania, Franklin Mott Gunther, toured the meat-packing plant where the Jews were slaughtered with the placards reading "Kosher meat" on them. He reported back to Washington: "Sixty Jewish corpses were discovered on the hooks used for carcasses. They were all skinned . . . and the quantity of blood about was evidence that they had been skinned alive". Gunther wrote he was especially shocked that one of the Jewish victims hanging on the meat hooks was a five-year-old girl, saying that he could not imagine such cruelty was possible until he saw the evidence of it firsthand. "In the big hall of the slaughterhouse, where cattle are hanged up in order to be cut, were now human naked corpses . . . On some of the corpses was the inscription "kosher". There were Jewish corpses. … My soul was stained. I was ashamed of myself. Ashamed being Romanian, like criminals of the Iron Guard". Romanian fascists, members of the Iron Guard, arrested by the Army after the Bucharest pogrom and anti-government rebellion. During the days of the rebellion, Antonescu avoided direct confrontation with the Legionnaires but brought military units, including 100 tanks, into Bucharest from other cities. 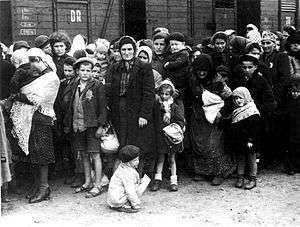 As the chaos spread--worrying even Hitler, who was interested in Romania as an ally--the horrific picture of the pogrom became clear. As stories spread, the military's fury against the Legionnaires grew (the Legionnaires had assaulted captured soldiers, stripped them of their uniforms, and even burned several of them). When Antonescu thought the moment was most appropriate, he gave the order to crush the rebellion. The military, led by Gen. Ilie Şteflea, quelled the rebellion in a matter of hours with little difficulty. The Legionnaires could not defend against the military's superior firepower. As soldiers stormed their strongholds, the Legionnaires fled. During the skirmishes 30 soldiers were killed and 100 were wounded. The number of legionnaires killed during the rebellion was approximately 200, although in later years Horia Sima would claim there had been 800 legionnaire casualties. After the rebellion was suppressed Antonescu addressed the public on the radio, telling them "the truth", but never mentioning the pogrom. He asked the German garrison, which had sat idly by throughout the rebellion, to show their support. German troops were sent marching through the streets of Bucharest, ending in front of the Prime Minister's building, where they cheered Antonescu. After the Legionnaires' fall the trend reversed, and the opportunists who had joined them fled. The press stopped supporting the Legionnaires, but remained anti-Semitic and nationalistic. Some of the Legionnaires' leaders, including Horia Sima, fled to Germany. Around 9,000 members of the Legionnaires' movement were sentenced to prison. The Legionnaires who led the anti-Semitic movement in Romania had fallen and never regained power. However, the movement continued even without them, although it was set back for a while, as the atrocities of the Bucharest pogrom gradually became known to the Romanian public. A few months later those atrocities paled in severity compared to those of the Iaşi pogrom. One leader of the pogrom, Valerian Trifa, became a cleric and emigrated to the US, where he became a citizen, but he was stripped of his citizenship in 1982 and left the US rather than be deported. 1 2 "The Nizkor Project – The Pre-War Years". Retrieved 2007-03-24. 1 2 Ancel, Jean (2002). History of the Holocaust – Romania (in Hebrew). Israel: Yad Vashem. pp. 374–75. ISBN 965-308-157-8. 1 2 An image of some of the bodies can be seen online: Bodies of Jews killed in the Bucharest pogrom, Simon Wiesenthal Center. 1 2 3 4 5 6 7 8 9 10 11 12 13 14 15 16 17 18 19 "The report of the International Commission on the Holocaust in Romania (in English and Romanian)". Retrieved 2011-11-30. 1 2 3 4 5 6 7 8 9 10 11 12 13 14 15 16 17 18 Ancel, Jean (2002). History of the Holocaust – Romania (in Hebrew). Israel: Yad Vashem. ISBN 965-308-157-8. For details of the Pogrom itself, see volume I, pp. 363-400. ↑ Ancel, Jean (2002). History of the Holocaust – Romania (in Hebrew). Israel: Yad Vashem. pp. 354–61. ISBN 965-308-157-8. 1 2 Ancel, Jean (2002). "Chapter 11". History of the Holocaust – Romania (in Hebrew). Israel: Yad Vashem. ISBN 965-308-157-8. ↑ Simpson, Christopher Blowback America's Recruitment of Nazis and its Effects on the Cold War, New York: Weidenfeld & Nicolson, 1988 page 255. (Romanian) Radu Ioanid, Pogromul de la Bucureşti (covers the pogrom section).